Happy 70th birthday Bailey of Bristol! It’s a special year for Bailey of Bristol as they celebrate seven decades of leisure vehicle production and design. To mark this milestone, they launched the Bailey Unicorn GT70 last year, and there’s the promise of more celebration editions throughout 2018. We were invited on an exclusive tour of their Bristol factory for an insider view of how their touring caravans are produced. It’s fair to say that since their humble beginnings when the first Bailey caravan was built by Martin Bailey in his garage in 1947, Bailey Caravans is now one of the biggest manufacturing employers in Bristol and one of the largest producers in Europe, making around 6,500 caravans and 1,200 motorhomes each year and employing 600 local people across its three sites. On our visit to the factory we were immediately impressed by the huge, 14 acre site but equally the strong family culture which pervades throughout the business. Bailey Caravans continue to be a real family affair, ever since Patrick and Stephen Howard bought the business in 1977. Forty years on it still remains in the Howard family, with Nick and Simon Howard being the third generation at the helm of the business. Plus, Simon tells us that lots of their staff have worked at Bailey all of their life, with three generations of some families working there, and an average length of employment of 12 years. Bailey also export worldwide to markets in Australia, New Zealand and South Korea, with the Bailey Rangefinder being a bespoke product made in Australia. 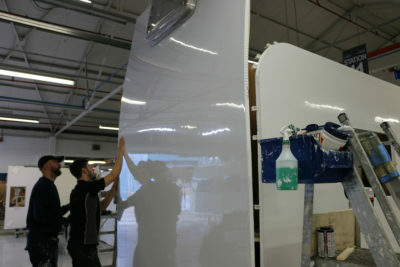 The body shell panels are made in the UK at their specialist laminating plant and shipped to Australia once a month to their manufacturing plant in Melbourne. They also have three factory-owned dealerships in Victoria, New South Wales and Queensland. And Bailey Parts, now trading as Prima Leisure, is a rapidly growing arm of the business, selling caravan and motorhome parts and Bailey branded products from five shops – with more in the pipeline. Bespoke Bailey products include their Prima awning range, plus many other outdoor leisure essentials. 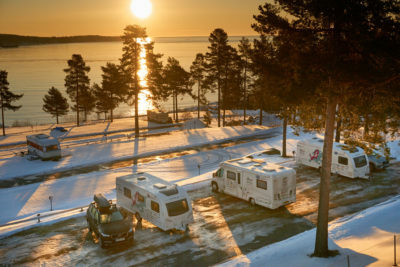 On our visit to Bailey Caravans we were keen to learn more about the Alu-Tech body shell construction system, particularly after their epic 16-day, 5,000 mile journey to the Arctic Circle in two Pursuit caravans and an Autograph 75-2 motorhome. 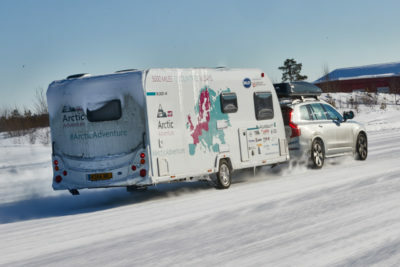 The ‘Arctic Adventure’ was a real-life product endurance test to demonstrate that their caravans and motorhomes are built to withstand extreme temperatures and to be used all-year round. Oh, and showing the world the remote and breath-taking places a leisure vehicle can take you to. It’s 10 years ago since the Alu-Tech construction system was introduced, and was seen as the most significant development in leisure vehicle production technology at the time. Nearly 50,000 Bailey Alu-Tech leisure vehicles have now been built, using a five part process, which includes the floor, two laminated side panels, a solid laminated back panel and a single span front and roof section. One of the first things we see when we enter the factory are trolleys of these laminated panels with the holes for windows, doors and lockers etc already pre-cut. 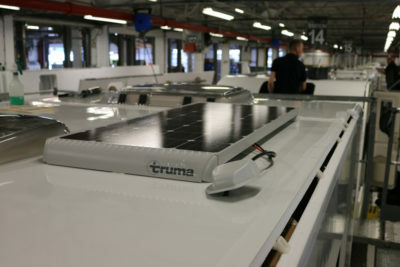 They’re delivered to the factory each day from their laminating plant in north Somerset. Stepping inside, it’s a hive of activity, and we’re met by a cacophony of electronic machinery, the constant clicking and banging of hand held equipment, people shouting and laughing, and timed sirens. It’s loud – but not unbearable – and actually quite a welcoming atmosphere. 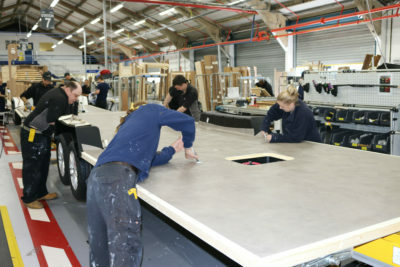 The production line starts with the caravan floor. Electrics, pipework, vents etc are all attached by one team, whilst another preps up the AL-KO chassis. Once this is lifted and fitted, a state-of-the-art crane lifts and flips the floor and chassis with absolute precision, so it can start it’s construction journey through the bustling factory. Each work station has a team of people working on a particular part of the build, with a set time to complete their construction. It’s fascinating to watch this troop of builders, armed with bonding guns, hand drills, vehicle decals, cleaning cloths, and an amazing eye for detail, as they meticulously assemble a Bailey Unicorn caravan in unison with one another. 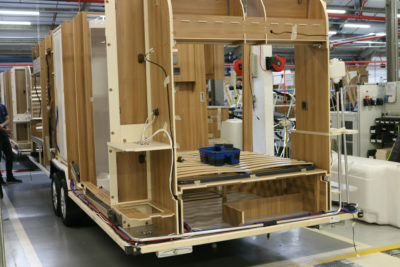 Once the floor is on, the caravans are assembled inside out, with all the living components and services added before the outer shell. Flat packed furniture, electrics, plumbing, bathrooms and kitchens are all sourced from Bailey’s 13,000 lines of components in their on-site Replishment Centre, with some other more specialist parts coming from Italy. They’re assembled and installed onto the chassis by highly skilled teams who have the necessary tools and fixtures within an arm’s reach and who work at waist height. 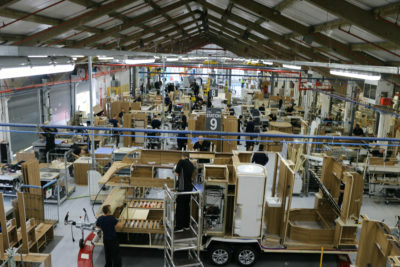 As they buzz around their work areas the caravan gradually takes shape as it moves down the production line. Once all the internals are fitted then out come the bonding guns and specialist fixing bolts as the side panels are fitted onto the floor and it’s bolted from underneath The unique Alu-Tech construction sees the panels bonded together to an aluminium extrusion framework, and then clamped together from the inside by connecting brackets. This is all then locked together with a T-bolt fixing and a plastic cap makes sure it all looks neat and tidy. There are few external fittings to the caravan and the upper body shell panels are completely timber-free with a GRP inner wall. This makes the caravan or motorhome a lot more robust, reducing damage in the manufacturing process and keeping the vehicle better insulated. Even the framing batons are made from plastic – making them resistant to water ingress – and very few holes are drilled into the body – plus every vehicle comes with a six-year water ingress warranty. The back panel is then fitted with ease and the single piece roof and front panel is lifted up and then folded down on to the top of the side panels. A solar panel is fitted and then brackets, batons and bonding materials secure the roof firmly into place. A short time later the windows and doors are fitted, as well as external lighting and all the electrics are tested before it gets it’s badged with the necessary Bailey decals and we’re finally introduced to the Bailey Unicorn Pamplona! Before it leaves the factory doors, everything is thoroughly tested and inspected, as well as cleaned and polished. 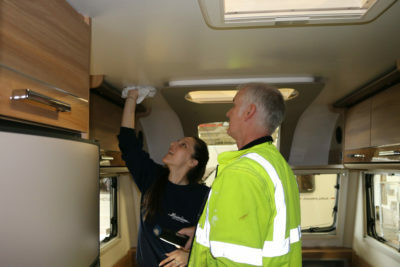 Each caravan takes around two-and-three-quarter hours to build from start to finish, with hundreds of dedicated workers involved. Not only does everyone clearly take pride in building leisure vehicles – or homes-from-home for the masses – everyone we met at Bailey was highly motivated and passionate about building a premium product, with safety, stability and security in mind. So what does the future hold for Bailey of Bristol? After the launch of the Unicorn GT70, Bailey says it has more celebrations planned throughout the year, as well as continuing to develop its Bristol site with a new factory, rolling out more Bailey Parts stores and expanding its product range. 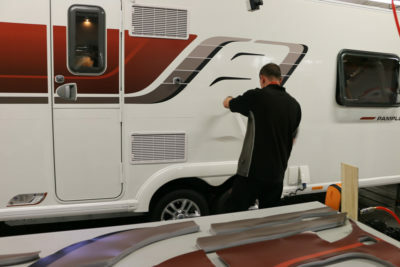 For more information about Bailey caravans or motorhomes visit www.baileyofbristol.co.uk.